Women marching towards the gate numbered 7 were assaulted in the protest. As the video circulates on the internet, ask how misogyny empowers men to suppress dissent. On Thursday, 7th February 2019, the women students engaged in a protest demonstration outside Jamia Millia Islamia University in New Delhi were attacked by unnamed individuals during the course of the march. The demonstration started on 31st January 2019, due to the outrage caused by the numerous accounts pointing towards the Head of Department (HoD) of the Faculty of Fine Arts, Hafeez Ahmed, being guilty of sexual misconduct and academic bias. In the accounts circulated on the social media profiles of various students, it was stated that the HoD had passed lewd comments on women’s clothing and physical appearance on various occasions. The news of the attack broke on the Internet when Pinjra Tod’s official Facebook page shared the account of the occurrences, with a video displaying the attack as it had happened. In the one and a half minutes’ long video shared on Pinjra Tod: Break the Hostel Locks, the viewer can see a group of students raising slogans like “HoD, haaye haaye! (HoD, shame shame! )” and “We want justice” while marching towards a gate at the university. First, a man with slippers in hand can be seen rushing into the crowd and attacking a protesting woman. Caught in a brawl, the attackers in the video hurled expletives as multiple witnesses recorded the incident on their smartphones. Later in the video, a ruckus is created as men rush to dismember the group nearing the gate, by hurrying to jump at a female involved in the march. They also stated that the system at Jamia was manipulated by Ahmed in a manner where he would allegedly give lower marks to the students who appealed to him. Not only was he accused of favouritism in academic marking, but some accounts also termed him placist, as he was accused of discriminating with hatred against Kashmiri students. According to a report published in NewsClick, the HoD had denied to comment on all the allegations against him, and referred to the protest as “fabricated”. He cited university protocol for his silence, and was not available to comment when DU Beat reached out to him. The report will be updated as and when the protest demonstrators, and/or the authorities provide a statement regarding the incidents. 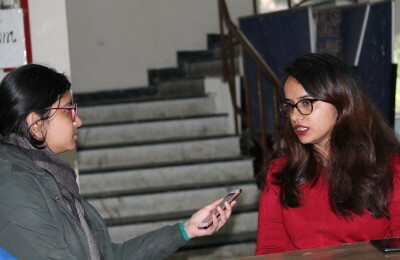 Muntaha Amin, a student of Jamia Millia Islamia who has been a participant at the protest gave her account of the events of 7th and 8th February to DU Beat- “One woman who was on hunger strike was assaulted and she had to be hospitalised. Another woman’s breasts were groped and squeezed by another goon of the HoD. NSUI came into the protest today, and disrupted it so that it got scattered for three to four hours. In fact, NSUI has a #MeToo accused, Imran Choudhary, in their own party. We started raising slogans against him, stating that we do not want an accused sexual abuser here, and then they started video-taping us, telling that they now knew who we were. Image Caption: Still from the video, showing men hurling to physically assault women protesters.